Free Shipping Included! Jodhpuri Decorative Vase Fillers for Centerpieces – Weave and Solid Plastic Sphere Bowl Mix for Table Décor – Green and White – 18 Assorted Pieces by Jodhpuri at Home Decor Outlet Store. MPN: 68025. Hurry! Limited time offer. Offer valid only while supplies last. Bring style to your home. Get this beautiful pack of handmade decorative spheres to add vibrant color, intriguing shape and texture to any room. Bring style to your home. 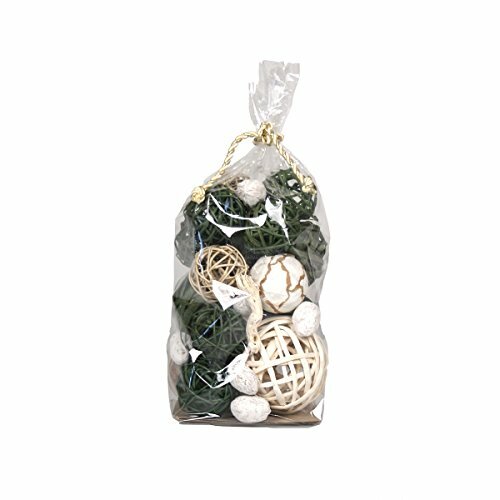 Get this beautiful pack of handmade decorative spheres to add vibrant color, intriguing shape and texture to any room. These fantastic decoration inserts are perfect for placing in a bowl or vase for the perfect holiday feel. These high quality botanicals will help you add a boost of personality or complement the colors of your living room, bedroom, or bathroom! If you have any questions about this product by Jodhpuri, contact us by completing and submitting the form below. If you are looking for a specif part number, please include it with your message.